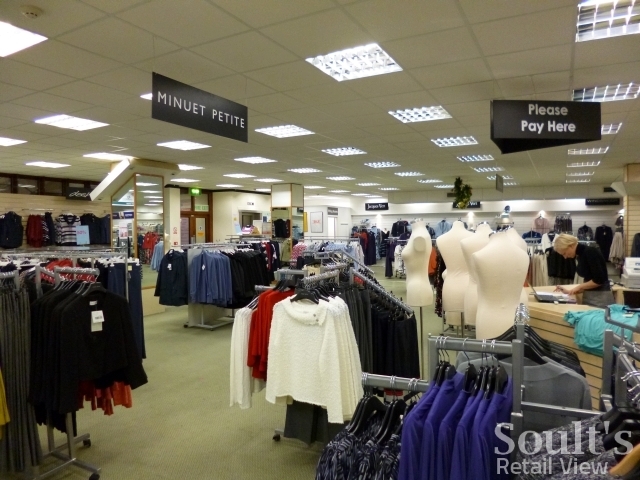 Tamworth shoppers now have access to a raft of Jacques Vert Group womenswear brands, following the opening of a new upmarket outlet concession in the town’s Co-op department store last Saturday (22 December). 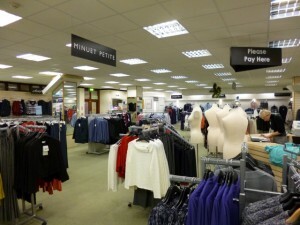 As well as the eponymous Jacques Vert brand, the first floor department also features the group’s long-established Planet, Precis and Windsmoor labels alongside brands that were previously part of Irisa – formerly Alexon Group – prior to its merger with Jacques Vert in January this year: Eastex, Alexon, Kaliko, Minuet Petite and Dash. 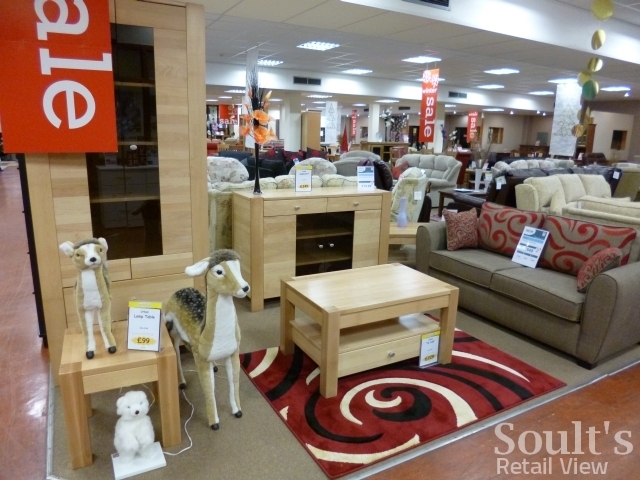 With these brands typically being found in high-end department stores such as Debenhams, Beales and House of Fraser – none of which have a high-street or out-of-town presence in Tamworth – it’s a welcome complement to the town centre’s strongly discount-focused retail offer. As I’ve mentioned before, Tamworth is somewhat unusual in still playing host to an independent Co-operative Society, founded in 1886, that is rooted in the town and that maintains a significant non-food presence. Even today, the Reverend William MacGregor – the town’s vicar, who was instrumental in setting up the Society and was its first Treasurer – is recognised as one of Tamworth’s most important historic figures. Fast forward to today, and Tamworth Co-operative Society’s three-level non-food store – generally referred to locally as ‘the Co-op’ or (more officially) “The Department Store” – is housed in a handsome 1903 building (and a less handsome 1960s extension) at the heart of Tamworth town centre. As most other local Co-ops have merged or been absorbed into the larger Co-operative Group, the Tamworth Society’s survival as an independent entity for over 125 years is remarkable. Nevertheless, the challenges that have prompted most other Co-ops to exit non-food – typified by 2009’s ill-fated disposals to Vergo Retail or ARCS’ deal with Beales last year – are never too far away. Compared to a few years ago, for example, the Tamworth department store now has a much larger proportion of concessions, largely as a direct response to the larger Co-operative Group’s exit from non-food in 2006 and Tamworth Co-op’s need to come up with new buying solutions. Add in the undisputed impact of Tamworth’s huge out-of-town Ventura Park – which has prompted big names such as WHSmith and New Look to exit the town centre – and Henry Boot’s seemingly stalled Tamworth Junction scheme around the corner, and it’s perhaps not surprising that profitability has proved elusive for the Tamworth Co-op department store in recent years. To its credit, however, Tamworth Co-operative Society has never shown any sign of giving up on non-food, and makes clear that it has no intention of doing so. 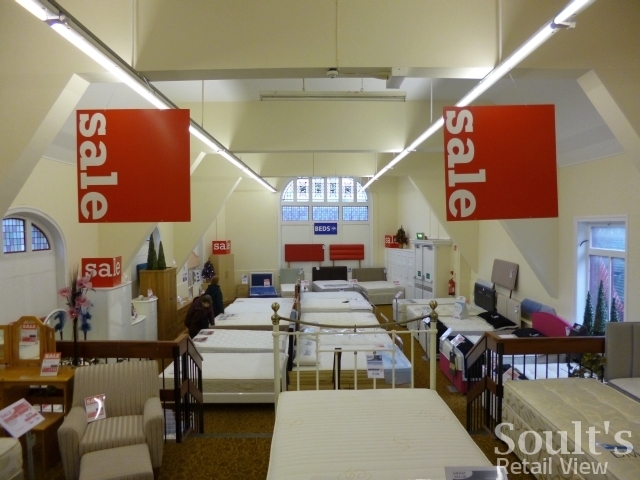 The Society’s latest financial update suggests that losses have been reduced, mainly, I understand, thanks to the closure of unprofitable branches in Burton and Swadlincote, and, at its Tamworth flagship, ongoing adjustments to the product offer and the addition of new concessions. 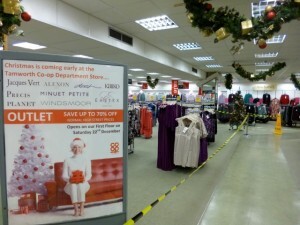 As things stand, the ground floor of the Tamworth department store is a slightly quirky mixture of (mostly) concessions, including The Co-operative Travel, Textiles Direct, The Co-operative Funeralcare, a mobility scooter specialist, The Co-operative Food, Store Twenty One, and the fashion brands Quiz and Tigi, with a recently opened women’s fashion outlet on the upper ground level. 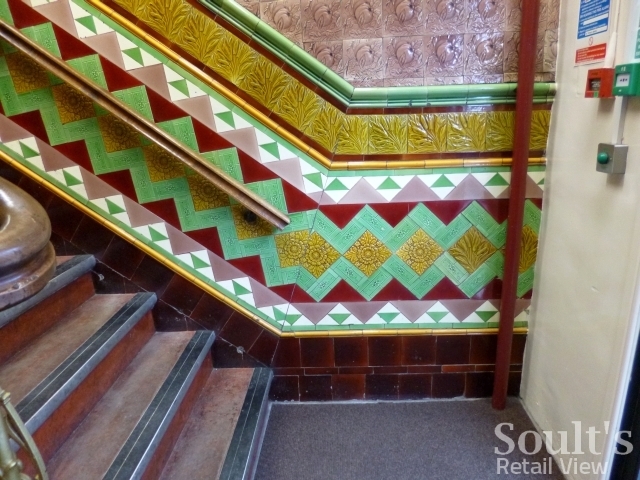 The store’s small in-house menswear department is also on this floor, occupying the space formerly occupied by Tamworth post office – now relocated to the smartly refurbished Tamworth Co-op supermarket further along the street. The first floor is again largely concessioned, including Rectella bedding and towels, a new Wood’s Gifts area, DIY (recently moved up from the basement), haberdashery, and the cookshop, alongside the new Jacques Vert concession. The second floor features the Cafe Alto restaurant concession, electricals and furniture, including a new bed department in a light and lofty part of the original building that had never previously been open to the public. Having shopped at Tamworth Co-op department store since I was a child, it has been quite sad in recent years to see it in what has felt like a slow decline. In particular, the removal of the store’s basement toy department a few years ago – a wonderful place full of childhood memories – genuinely felt like the end of an era, and a missed opportunity to encourage new generations of families into the store. However, revisiting the store on Friday last week I was really heartened by what I saw, with a much livelier and more optimistic feel in store than there was a couple of years ago. This sense of moving forward is also reflected in the department store’s excellent Facebook page, which has generated more than 200 likes since its launch in May. By adopting an engaging, chatty tone and making great use of images, it helps to counter what some might perceive as the Society’s slightly stuffy and old-fashioned image. What’s especially exciting is how much more there is that can be done. For all that the department store is making great strides in the right direction, there are plenty of opportunities to further improve the customer experience and restore profitability. Perhaps most obviously, there’s real scope to shout louder about Tamworth Co-op’s astonishing heritage and the department store’s longstanding position as the hub of the town. To my knowledge, for example, there is no other UK Co-operative Society where customers retain and submit their receipts in order to claim back dividend on all their Society purchases. 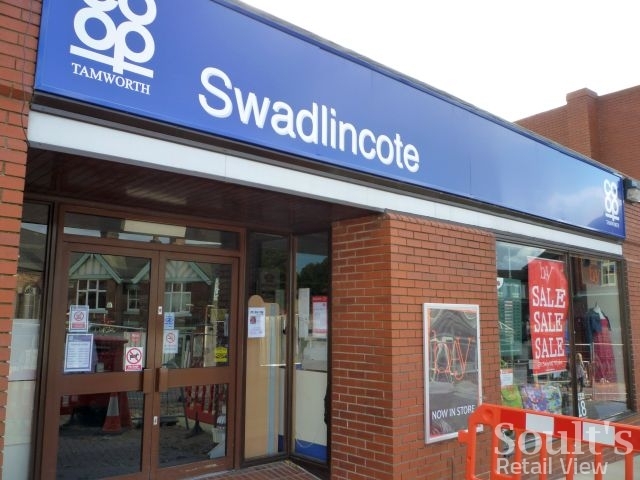 Current instore announcements featuring the slogan “We’re local, we’re independent and we care” are one really effective way of pushing this message, but I wonder how many Tamworth shoppers really understand that their local Society is just that – a truly local Co-op? Part of the problem may be the department store’s slightly confused branding. Walk around the outside of the store and you’ll see the historic name ‘Tamworth Co-operative Society Limited’, the old-style blue Co-op logo, signs featuring the wording ‘The Department Store’ and ‘Co-op Tamworth’, and the Co-operative Group’s familiar purple and green ‘The Co-operative’ fascias for the Funeralcare and Food operations. That’s before you add in the various concessions’ signage, of which Store Twenty One and Café Alto are particularly prominent. 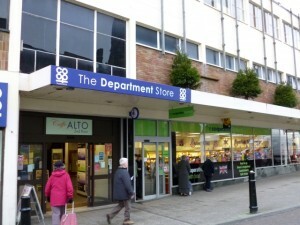 One solution might be to give the department store a proper, unifying brand – perhaps, in celebration of its history, something like ‘MacGregor’s – the Tamworth Co-op Department Store’. Such an approach would also help bring some cohesion to the ground floor, which is currently concession-heavy and lacks a sense of “Co-opness”. Despite their strong concession presence, the first and second floors are much more successful in this regard, genuinely feeling like a department store rather than a collection of separate businesses, but there’s a need to make sure that customers know what’s up there and are enticed to take a look. Reintroducing a toy department – or even a Toymaster concession – would be one good way of giving families with children an incentive to return to the store. I’m sure that these and other possibilities will be on Tamworth Co-op’s radar as it continues moving forward. Meanwhile, as I prepare a presentation for February’s National Retail Consumer Conference – organised by Co-operatives UK, and appropriately entitled ‘The Future of Co-operative Retailing’ – it’s heartening that at least one historic Co-op shows no sign of giving up on non-food without a jolly good stab at making it work for 21st-century consumers. 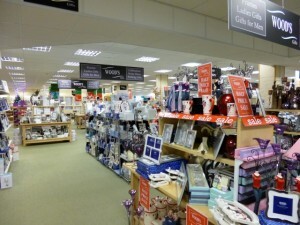 My retail consultancy business, CannyInsights.com, provides bespoke place- and sector-specific market intelligence, including coverage of department stores and consumer co-operatives. 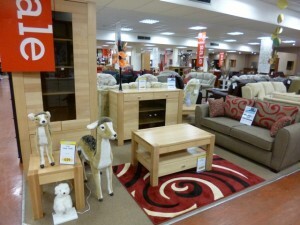 It also works with retailers nationwide to improve their stores, customer communications and market knowledge. For more information, visit www.cannyinsights.com, drop me an email, or give me a call on (0191) 461 0361. Next story Nipper on the brink: is there a future for HMV, and do we care? Previous story As HMV struggles, just how important is the pre-Christmas trading period for retailers? It would be so much better if all the various coops would amalgamate; they would have so much more purchasing power. Its as though they are run for the benefit of the board and staff members, not the people who shop there. Hi Lissie, much of the remaining non-food buying (and most of the food buying too) is done via group purchasing arrangements anyway, so merging all the Co-ops wouldn’t make much difference from that point of view! Will look out for it…I’ve visited six of the eight closing stores over time. 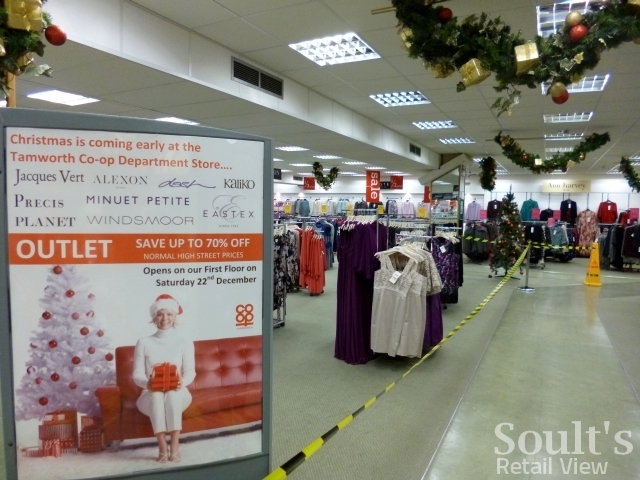 Just heard the sad – but not totally surprising news, that the Midlands Co-op are closing eight of their Home and Fashion department stores across the Midlands. I’m on it! :) A blog on said topic is nearly finished. I can’t help feeling it would be better if all the societies participated in the group dividend scheme. Tamworth has nearly 40 food stores within a 10 mile radius operated by TCG, Midlands and Midcounties as well as Tamworth. It can only be a source of confusion and frustration to customers for all those stores to have the group branding and yet some have a different dividend scheme. As far as branding the department store goes why not follow Midlands and Heart of england and adopt the Cooperative brand, their stores look very smart in it. Its good to hear that the store is in some ways on the up – I always enjoy my visits a couple of times each year on the train from Birmingham. I think your observation about Toymaster is interesting – especially as I believe they are also a co-operative consortium (i.e. a co-op of independent retailers who share buying, ranging and marketing functions). Similarly, I wonder if the DIY offering would be more coherent if delivered through Mica, itself a co-operative of independents in the sector? You’re absolutely right about the structure of Toymaster, Richard – from what I understand it is basically a Euronics-style buying group, consisting of independent retailers. There is a Co-op history there too – I believe the toy departments in ARCS’ retained Blyth and Scunthorpe stores are Toymaster concessions, though I assume Beales has taken it in-house in its acquired stores, as it did in Hexham when it took over the Robbs store.